Greetings my design-loving friends. If you are wearing socks, prepare for them to be knocked completely off. If you haven't been to Paris in a while, get saving up and booking some vacay time. At the very least, get ready to fill up your Dream Destinations Pinterest board. Why? Because Hotel Panache. 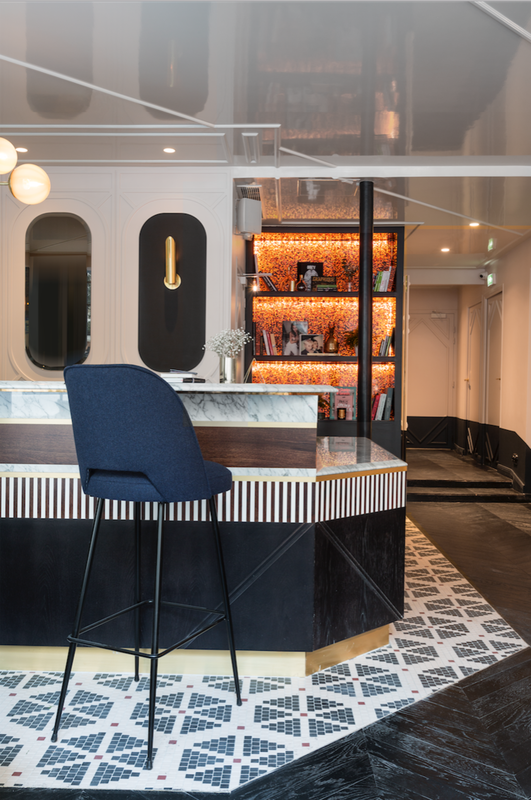 The hotel is located at the corner of Rue du Faubourg Montmartre and Rue Geoffroy-Marie in a Flatiron style building. Designer Dorothée Meilichzon was inspired New York and its Flatiron building. Fascinating, right? 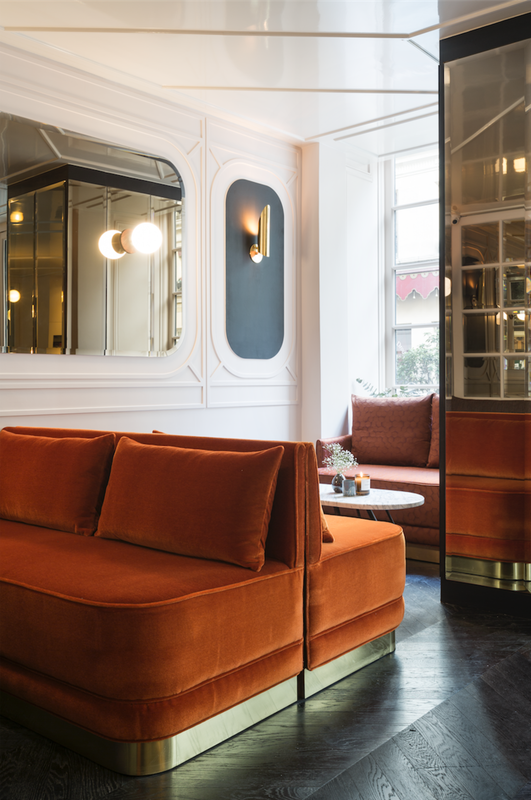 While the whole world looks to Paris as a hub of hotel and restaurant design chic, this Parisian looks to NYC. The entry and restaurant are an absolute visual feast of delicious velvet, brass, marble, intricate (though somehow modern) panel mouldings, chevron floors and patterned tile. And the lighting — amazeballs (literally, some are balls that are amazing). The design plays up the angles of the building with clever use of mirrors and cantilevered tabletops that appear like floating slices of wood. Small space tricks to steal include use of pendant lights instead of lamps to free up surfaces and slim-lined leggy seating (as well as those aforementioned mirrors and wall-mount tables). Pattered walls, floors and upholstery bring some playful zing, but beds are pure serenity all in white.